Block Electric was integral in the recent makeover of the historic Shakespeare Garden on Northwestern University’s campus. Shakespeare Garden was inspired by Shakespeare’s Midsummer Night’s Dream and contains plants that are mentioned in the writings of William Shakespeare. After sundown, the garden is invisible without lighting. 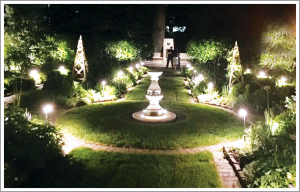 Between March and June of this year, Block Electric’s Frank Raucci and Brendan Christy worked closely with Northwestern University’s Landscape Architect Ann Ziegelmaier to install new landscape, pathway and bench lighting throughout the garden. Dozens of small LED lightbulbs were strategically placed throughout the historic garden to simulate the action of fireflies and fairies in Midsummer Night’s Dream. The fountain at the east end of the garden is lit by a pencil-thin fixture to represent moonlight, and the stone benches are illuminated from underneath.